The wellness facilities in this two-person bungalow will help you truly unwind. During your stay you have the option of relaxing in the sauna, followed by an outdoor shower, or let your body cool off in the cold plunge bath. Then enjoy taking a dip in the Jacuzzi! These facilities are private and are located in and around an outbuilding of the bungalow. The bungalow's cosy living room contains a spacious sitting area with a wood stove and a reading nook. And when the weather is nice you can open the patio doors to the terrace. You can look into the deep garden when sitting on the covered terrace. The spacious and light-filled bedroom has a double bed with box springs. 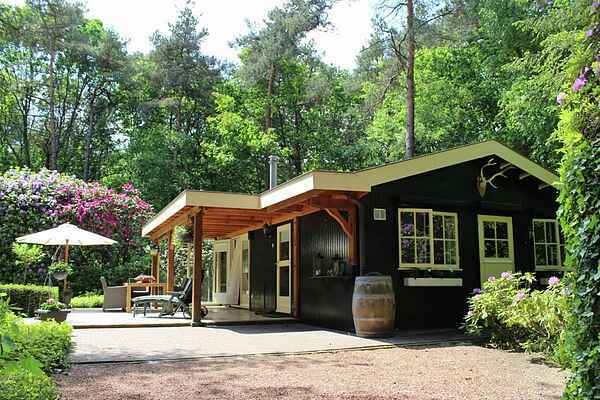 The bungalow is located on a 2500 m2 private parcel at the edge of the forest near the Twickel Estate. With its fabulous castle gardens, this 4000-hectare estate is an excellent place to go walking. On the estate you will also find Twickel Castle, 150 farmhouses with their distinctive black and white shutters, watermills, a water tower and a sawmill. Golf lovers can head to the Twentse Golfclub, just a fifteen-minute walk from the bungalow. Relax and enjoy your stay in this marvellous holiday house!